Thingiverse – Thingiverse is a place to search for or share digital designs with the world for laser cutters, CNC machines, 3D printers, and even automated paper cutters. The site is hosted by 3D printer manufacturer MakerBot. Instructables – A DIY online community that allows you to explore and upload creations. Owned by Autodesk. Look for the educator portal for curated resources sorted by grade levels and subjects. Tinkering Studio Projects – Thoughtful and well-documented crowd-pleasing projects from the Exploratorium Museum in San Francisco’s Tinkering Studio. Make Magazine Projects – Projects in electronics, craft, science, art, robots, and many more categories in all ranges of challenge. Sparkfun Tutorials – Beginner, intermediate, and advanced tutorials for Arduino, electronics, wearable computing, and more. Adafruit Learning Portal – Projects, guides, and tutorials on Arduino, microprocessors, components, tools, and more. How Stuff Works – Diagrams, videos, and podcast explanations of how things work. Originally this site mostly featured machines and technology, it now encompasses a wider array of health, lifestyle, culture, and other possibly inappropriate categories. Raspberry Pi Foundation Projects – This is a searchable, sortable database of beginning to advanced maker projects. The projects are NOT all Raspberry Pi, there are micro:bit projects and some with just electronics. There are also many programming projects using Scratch, Python, and App Inventor. Makershare – Make Magazine and Intel sponsor this online space for maker portfolios, project tutorials, and showcases. Maker.Pro – An online database of projects in a wide variety of categories including electronics, fabrication, and microcontrollers. Most are high school level or above. You can upload your projects and make them public or private. Sylvia’s Super Awesome Maker Show – YouTube star Super-awesome Sylvia and her father produce a whimsical video show showing how to build fun electronic projects. Geek Dad & Geek Mom – Chris Anderson started the “Geek Dad” blog on Wired magazine in 2007 but has since passed it on to a team of writers. The site features product reviews and project ideas for families. Built By Kids – Project ideas, tool tutorials, and activities for kids and families. Free Kids Crafts – Crafts and projects using everyday and recycled materials. Tech Will Save Us – Creative kits and free online projects for families. Based in the UK but ships worldwide. Meaningful Making: Projects and Inspirations for Fab Labs and Makerspaces – Two volumes of articles and projects contributed by FabLearn Fellows, educators in formal and informal fabrication labs and makerspaces worldwide. Free to download, print version also available. Marble runs and ramps – 15 easy to build marble runs, ramps, and games. Marble runs and ramps – The Tinkering Studio site for Marble Machines. These large scale machines are built for crowds, but the resources will be helpful for any size build. Scribbling machines – Easy to build robots using scrap materials with pens for legs and a small off-center motor. The vibrating motor causes the robot to dance around and scribble on a large sheet of paper. Paper Circuit Mural – Everyone can participate in creating a large mural with LEDs. This group project from the Lighthouse Creativity Lab is good for a Maker Day or family workshop. LEGO Art Machines Kit – The Tinkering Studio guides and parts lists for LEGO Art Machine activities. Wind Tubes – Easy to make large upright tubes with a fan at the bottom. Makers can build “stuff that floats” out of recycled materials, put their creations in the tube and watch them fly up to the sky! Imagination Foundation – Created after the success of the YouTube video Caine’s Arcade, this foundation supports creativity and entrepreneurship in children worldwide. The Cabaret Mechanical Theatre – Projects, blogs, and kits for building whimsical moving mechanical sculptures. Cranky Contraptions – Easy to build, simple automata from the Tinkering Studio at the San Francisco Exploratorium. Cardboard Automata – Machines made of cardboard that tell a story through movement. Digitally Interfaced Book: Paper, Graphite, Makey Makey, Scratch, and Imagination – Instructions for completing an interactive book project. Scratch Coding Cards: Creative Coding Activities for Kids – A must-have for any Scratch-using classroom. Code Club Projects – You don’t have to belong to a Code Club to view their free starter projects for youth ages 9-13. Projects can be found in dozens of different languages. Coder Dojo Projects – You don’t have to belong to a CoderDojo to use the free resources on the website. Find good starter projects for beginning coders on their site. Drawdio – Allows you to turn a pencil into a simple music synthesizer. You can play music while you write! Build your own or buy a kit. Minty Boost – A small kit that lets you create a battery-powered cellphone charger that fits inside a tiny gum tin. The kit doesn’t come with the tins, so you might wish to purchase those too. LED Throwies – An LED taped to a battery and a magnet creates a crowd-sourced light show. TV B Gone – A tiny contraption that turns off (or back on) any television in your vicinity. This has serious mischief potential and can make your colleagues want to kill you, but kids love it and can learn a bit about electronics too (before being chased from the mall). The Invent to Learn Guide to Fun – By Josh Burker. A collection of whimsical projects perfect for classroom exploration. Projects include step-by-step instructions and full color photographs. The Invent to Learn Guide to More Fun – By Josh Burker. 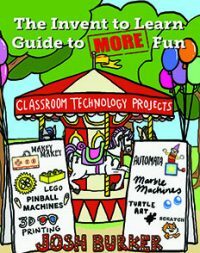 A second volume of creative and fun projects using a variety of maker tools and technology.